Hazardous Materials (HAZMATs) are found everywhere. They include all sorts of chemicals, fertilizers, industrial materials- the list of all hazardous materials is huge. Most times they have handling restrictions to help prevent accidents in storage and transportation. Many times, anyone that handles them is expected to wear personal protective equipment. They are often found in industrial facilities, but can also be found in residential homes as well. Trucks, trains, and planes can transport these hazards through areas where they may not usually be found. HAZMAT materials can pose airborne, contact, ingestion, and radioactive threats so they are not always easily identified. Industrial facilities have HAZMAT materials marked. 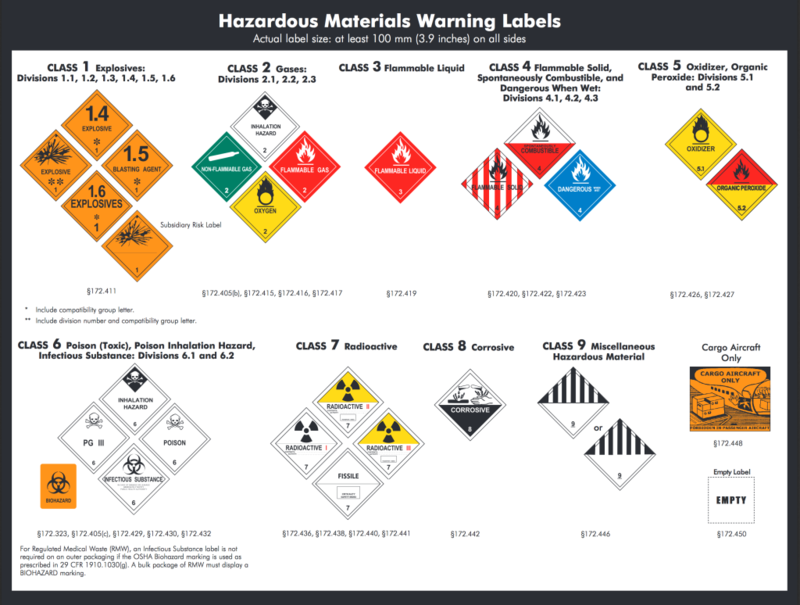 Any material posing any type of risk (including non-HAZMAT) is listed in a Material Safety Data Sheet (MSDS) binder. Most homes do not have this level of identification and safety. Be sure you know where your hazardous materials are kept, and consider securing or marking them to avoid household incidents. Firefighters are usually trained in how to deal with HAZMAT emergencies, but many emergencies are unpredictable accidents where first responders may not be immediately on the scene. 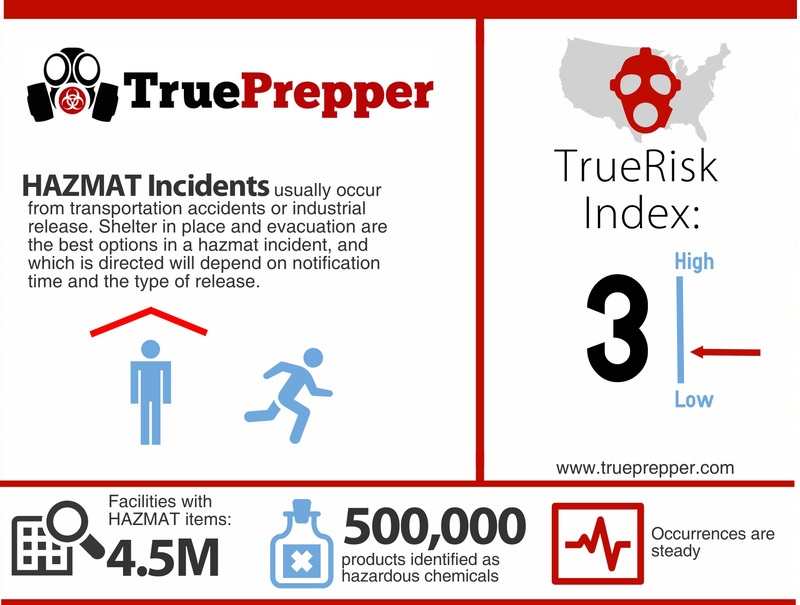 HAZMAT incidents are typically localized and very fatal. The incidents occur quickly and also escalate quickly. Whether it is a simple accident occurring in a home, or a transportation disaster that affects a large area, the severity of injuries is usually linked to exposure time. While some chemicals give warning by being visible or with odors, many are invisible and odorless. 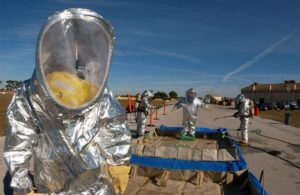 It is virtually impossible for a HAZMAT incident to cause TEOTWAWKI (The End of the World as we Know It) since it does not have the means to be large scale. A single incident could cause a large disruption if the victims were linchpins of society, but a collapse or world-altering scenario is extremely unlikely. As always, it is the unforeseen that is the hardest to plan for- so there is a still a slim possibility that a destabilization could occur with a HAZMAT incident that we simply cannot predict. Planning for a HAZMAT incident can make all the difference in an emergency. The tools and resources you have combined with the plans you make can keep you alive and well. Becoming familiar with your kits and practicing your plans are both keys to being fully prepared. When an incident occurs, you will likely have little to no time to be ready. Evacuation or shelter in place may be in order, depending on the circumstance. If you are asked to evacuate by officials, you should do so as quickly as possible, bringing your portable survival kits and/or bug out bags with you. Shut your doors and windows if there is time to avoid long term contamination. If the incident occurs when you are outside, you should try to get uphill and upwind immediately. Avoid gas clouds, fumes, and smoke. If you are in your vehicle, you can evacuate, or shelter in place if you have the tools in your car to do so. If you are asked to stay put, follow your shelter in place plan as quickly as possible. A shelter in place directive instead of evacuation likely means your area is too high risk for evacuation and you will have to ‘ride it out’. When the incident is over, the real work is just beginning. If you have been exposed to hazardous materials, you will need to seek medical attention quickly. If authorities have decontamination instructions, you should follow them immediately. Stay informed as much as possible about the incident and how to mitigate all of its effects. If you have been evacuated, authorities should let you know when it is safe to return home. Once you are home, you should ventilate your house and make sure there are no residual vapors or smells.